If you like this free game, try Royal Envoy. Team up with Cedric once again, for another exciting adventure! The King turns once more to you, his trusted city planner, to travel to the faraway land of Middleshire devasted due to the poor management and negligence of its rulers. Here you will be greeted by a host of zany new characters, and meet a few old favorites. Explore ancient caves and forgotten mines, meet mystical nymphs and leprechauns, engage in snowball fights in the frigid arctic, and rescue the people of Middleshire from the fires of a terrible volcano. 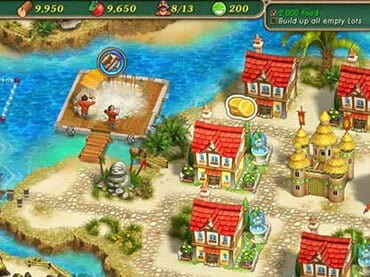 With you as their guide, the people will build a veritable paradise - while you win prizes for your speed and quick wit! Free Game features: - 63 unique levels and 30 bonus challenges; - Over 60 achievements to unlock; - Lots of all-new quests; - An exciting story with zany characters; - Original soundtrack. If you have questions about Royal Envoy 2 game, please contact us using this form.